A utility tractor with John Deere's PowerTech™ turbocharged diesel engine gives you the torque, drive and durability you need throughout all the seasons in Louisiana. These efficient, reliable engines have proven themselves in countless applications and over thousands of acres, so you can work with confidence, weekend after weekend. Learn more about the 5045E Utility Tractor or see more tractors under 50hp or less than 100hp. ¹Offer valid on new 5045E 4WD Tractor purchases made through 04/30/19 with 520M Loader and 2018 John Deere MX6 Lift-Type Rotary Cutter- 540 RPM PTO. Subject to approved installment credit with John Deere Financial. Up to a 20% down payment may be required. Bonuses up to $4,250 applied while supplies last. Example: Based on a purchase of $31,198 with $4,250 bonus and $6239.60 down payment, monthly payment of $297 at 0% APR for 84 months. Taxes, freight, setup and delivery charges could increase monthly payment. Valid only at participating US dealers. 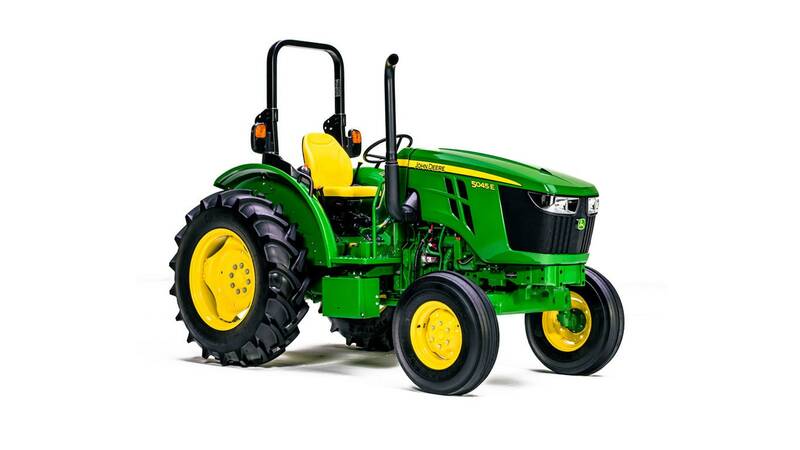 †Beginning 9/1/2016 all 5E Series Utility Tractors purchased new from an authorized John Deere dealer come standard with a 5 year/2000 hours (whichever comes first) Powertrain Warranty. See your local John Deere dealer for details.